Benjamin Butler paints trees. As a shtick, it’s awfully specific, but as a formal constraint, it’s surprisingly open-ended, because the organic patterns of a plant’s growth, while necessarily always having a particular, recognizable type of coherence—one that’s similar to but more limited than that of any good painting—are extremely flexible; because Mr. Butler can pull those patterns almost to literal figuration, or push them toward decorative abstraction; and because of his sophisticated but fanciful colors. Blue Forest, for example, is predominantly robin’s egg blue, and two called Untitled Forest are orange and lavender, respectively. All three divide canvases roughly the size of a sheet of legal paper into broad, vertical, bamboolike stripes of color between narrower, darker lines that also branch out diagonally. It’s a kind of left-hand figuration, a visual onomatopoeia that creates the sensation of looking through leaves and trunks by replicating not their actual shapes, but their formal density. And they do this not only on the x-y plane, but also on the z axis, by means of unexpected brightnesses of color and well-timed half-steps away from chromatic harmony—teal under lavender, a bit of emerald green under pale gold. Like a real forest, they’re deep patterns that can also register as flat. 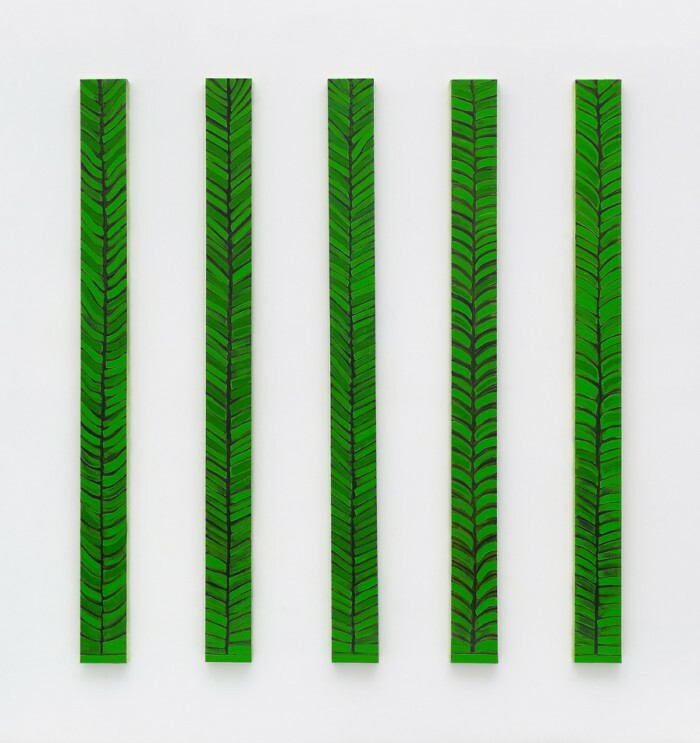 A larger piece, Green Forest, consists of five extremely narrow canvases just over six feet high, variably spaced according to the size of the wall, each split down the middle by a black line with stripes of green not so much branching out as coming together. Yellow Tree looks like the cross-section of a strange tropical fruit or alien muscle fiber. And five paintings each titled Grey Tree experiment with different types of branching lines, straight, swooping, hanging, bow shape. But the strongest pieces are the ones in which the branches serve merely as frameworks for holding color. Autumn Forest (Sixty-Three Trees) is divided into 63 vertical strips. These strips are crossed by dozens of swinging angled lines, legible not only as branches but also as curtains, vines or lines of some decadent-period Arabic calligraphy; they make the orange-yellow, sunset-orange and fire-ending-red tree trunks behind them look like psychedelic rain.